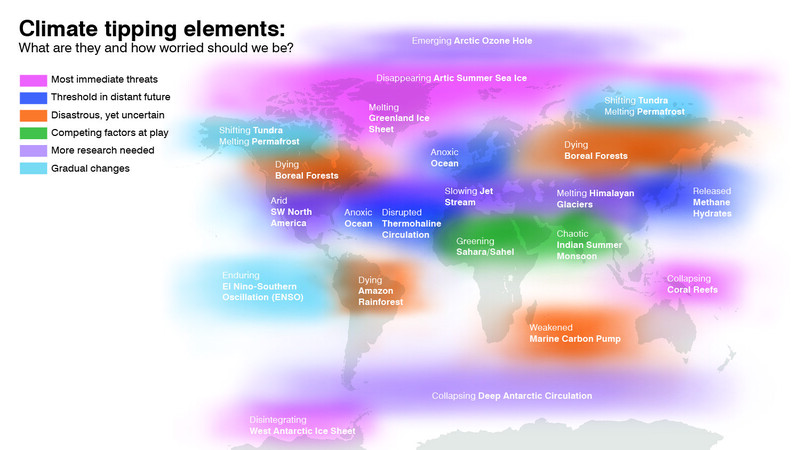 Are we reaching our climate change tipping points? Climate change is affecting our world, and some places are reaching a critical level in impacting our world. Collapse of Coral Reefs – Healthy corals maintain a symbiotic relationship with the algae that provide their primary food source. As oceans warm and become more acidic, these algae are expelled from the corals in an often fatal process called coral bleaching. Research predicts that most of our remaining coral systems will collapseeven before a global temperature rise of two degrees Celsius. Dieback of Boreal Forests– Increased water and heat stress could also lead to a decrease in boreal forest cover by up to half of its current size. Dieback of boreal forests would involve a gradual conversion to open woodlands or grasslands, but complex interactions between tree physiology, permafrost melt, and forest fires renders the likelihood of dieback uncertain. Appearance of Arctic Ozone Hole – Unique clouds that form only in extremely cold conditions currently hover over Antarctica, serving as a surface for certain chemical reactions and facilitating the existence of the ozone hole. As climate change continues to cool the stratosphere, these “ice clouds” could begin formation in the Arctic and allow the development of an Arctic ozone holewithin a year. Slowdown of the Jet Stream –A narrow and fast moving air current called a jet stream flows across the mid-latitudes of the northern hemisphere. This current separates cold Arctic air from the warmer air of the south and consequentially influences weather in its formation of high and low pressure systems. A slowing of the jet stream has been observed over recent years. Should slowing intensify, weather patterns could persist over several weeks with the potential to develop into extended extreme weather conditions. Tundra Transition to Boreal Forest– Much like the conversion of the Amazon Rainforest and boreal forests to other biomes, tundra environments may transition into forests as temperatures increase. However, this process is more long-term and continuous.